Step 1: On the product you have selected, click on the ‘Add Product’ button to add the product to the clipboard. Step 2: Click the Clipboard button, tick the box on which product/products you are wanting to make a credit note on, after click on ‘New Project’. 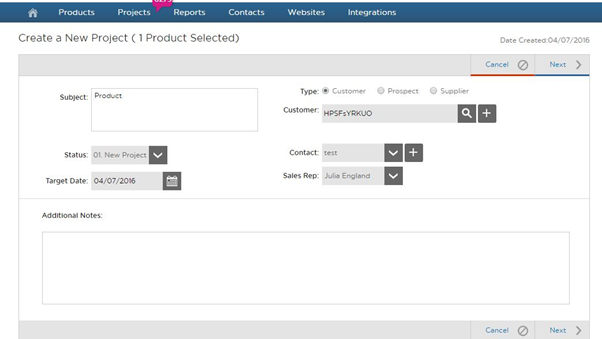 Step 3: Add a subject to the project, click on customer and enter the name in the search box. Click on next and select ‘Create a Quote’. 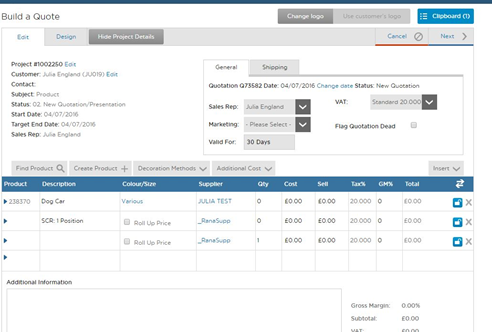 Step 4: You are now on build a quote, this is where you can add decoration methods or an additional cost, once this has been completed click next followed by ‘Send/Share’. 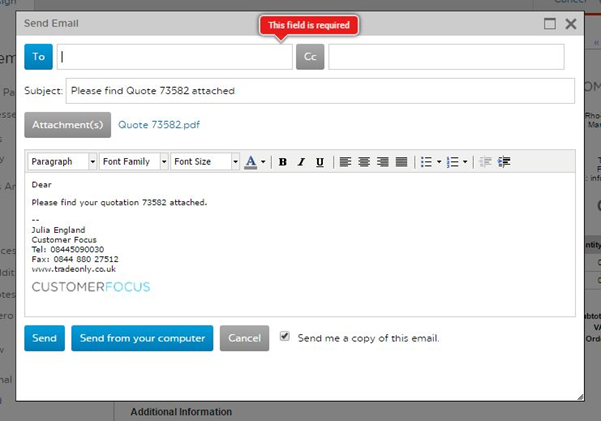 Step 5: From this point you enter the email you want to receive a copy of the quote, additional if you would also like to send a copy to yourself click the tick box next to cancel. 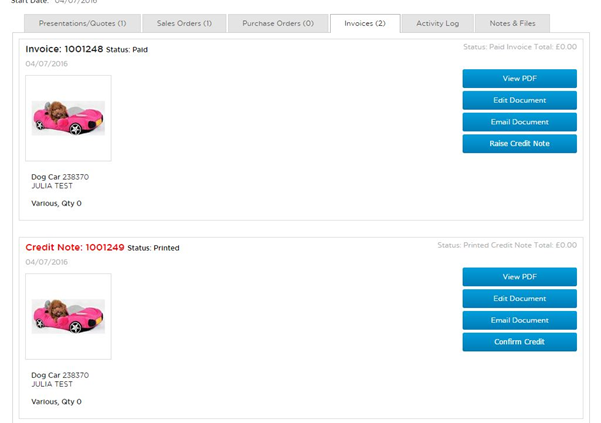 Step 6: The email now has been sent, if you go back to edit and click next you now want to create a sales order and repeat Step 4 of Send/Share and Step 5 of putting the email address in which you want the copy of the sales order to go to. 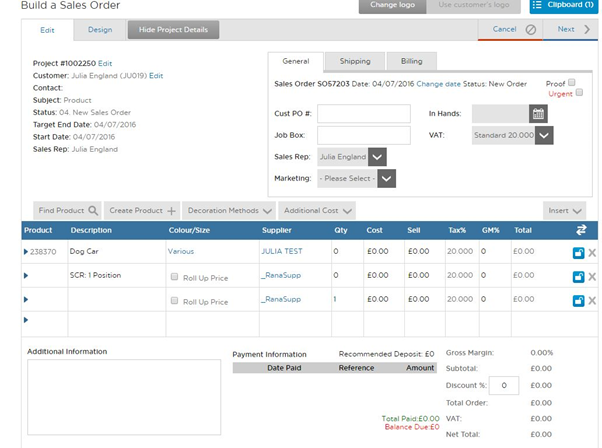 From then you repeat this step but now click next and generate sales invoice. Step 7: Next you hover over Project and click on Overview. You now need to go into the project you have created. 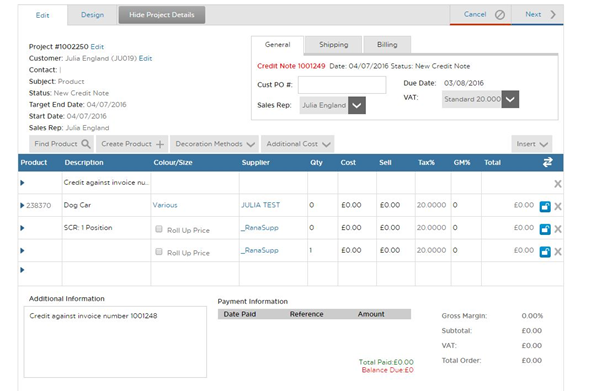 Step 8: Go on to the invoices tab and click on invoice paid, click ‘yes’, go back to project overview and then click onto raise credit note and click on ‘yes’. Step 9: It will take you to this page. If you want to send a copy to a selected email address including yourself you do the same as Steps 4/5/6 (Click Next->Send/Share). Step 10: If you go back into Projects -> Overview -> Invoices the status should now be ‘Paid’.